I’m a newcomer when it comes to Banquets. I never really heard of the band until “Fade from Gold,” a song from their new self-titled LP, was debuted. After listening, I was immediately hooked and stoked on this band. It was the most catchy take on punk-rock I had heard in a while. To me, I could hear subtle hints of a ton of bands I loved, like Daytrader, Polar Bear Club, and even The Gaslight Anthem. That's not a bad mix of familiar styles, if you ask me. The record starts off with “Little Shallow,” bringing you in with a nice little riff, followed by some pounding drums. “Little Shallow” then soars into some extremely catchy vocal melodies and guitar work. Track two is “Big Bad Waves,” keeping the pace going strong, but changing things up ever-so slightly. This song is a bit darker than the first. Next up is an instant classic for me, which is “Call It A Comeback.” This is the definition of a punk-rock anthem. It has catchy hooks and sing-a-longs for days. “Paths” had a lot of moments where the vocals really stood out. It’s one of those songs that you feel rather than hear. There’s a lot of emotion in it. “March 19th” begins with a beautiful guitar riff, and the transitions in this song are extremely smooth. “March 19th” closes with a nice little moment of guitar and vocals only. Speeding things up a bit is “Starts and Stops,” using the infamous punk beat, but yet still keeping things interesting and fresh. The song takes a different direction towards the middle, and continues to change as it goes on. When a song changes this much in a short amount of time, it normally loses my attention, but “Starts and Stops” did the exact opposite. 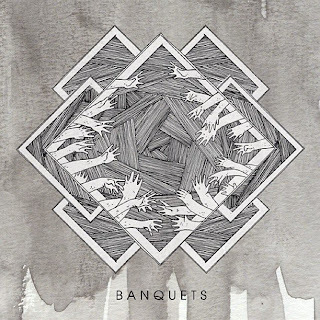 “Fade from Gold” was the song that introduced me to Banquets. The vocal melodies in this track are beyond catchy, and the tempo change towards the 3/4 mark is something you will never forget. Track eight is “Bums in the Breeze,” presenting a slower pace that had not yet showed up on this release. The build up this song has is so awesome, and the song goes out with a bang. “The Flicker and the Flame” has my favorite riff on the entire record. At this point in the album, two things are for sure: this band can write transitions like no other and they can also write choruses catchier than those top 40s ones that get stuck in your head even though you hate them. The big difference here is that you’re not going to hate these ones, but hope they never leave your head. Closing the record is “Daggers,” throwing you into, yet again, another whirlwind of catchy guitar riffs. It’s nothing short of a perfect album closer. It just has the right pace and feel that a closing track should. Overall, this is definitely a punk-rock record. 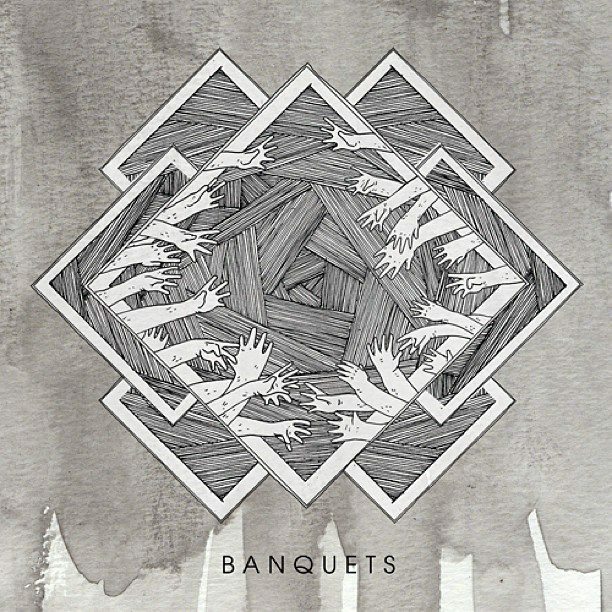 The one major difference between Banquets’ self-titled LP and other punk-rock releases recently is that rather than being constantly fast, or in your face, it’s just fun and catchy. I feel that some people who don’t even necessarily enjoy punk-rock could find this album interesting. There’s something special about this band, and I’m really hoping fans of the genre catch on quick. This record deserves to be heard by many, and I cannot express enough how fun and catchy this record is. Be sure to pick up a copy through Black Numbers when it’s released on May 7th.